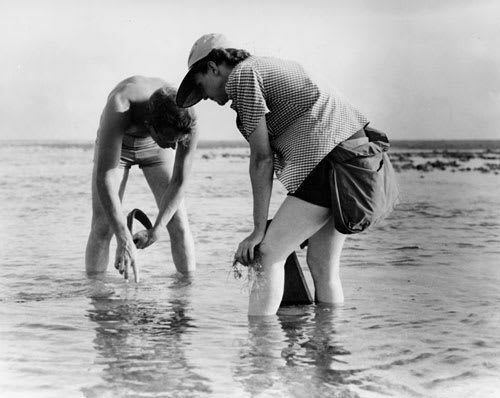 Rachel Carson (1907 – 1964) was a marine scientist and environmentalist who wrote extensively on the impact human behaviour was having on the planet. Her seminal work “Silent Spring” (1962) was influential in raising environmental issues and questioning the direction of human scientific progress. Her work is widely regarded as a founding book of the modern environmental movement. Carson was born 27 May 1907 on her family farm in Springdale, Pennsylvania, close to the industrial city of Pittsburgh. As a child, she was something of a loner, enjoying spending time in nature and exploring her families farm. As she grew up, she was aware of the increased industrialisation of the region, and she could see smoke billowing from nearby factories. She became aware of the cost of this industrial pollution and how it affected life in the local area. From an early age, she had a strong belief she would become a writer. Aged 11 she won first prize for an essay published in St. Nicholas Magazine. Carson graduated from Pennsylvania College for Women in 1929 with a major in biology. In 1932, she completed a master’s degree in zoology at John Hopkins University. Her thesis was: “The Development of the Pronephros During the Embryonic and Early Larval Life of the Catfish.”. She hoped to continue her studies and gain a doctorate, but her family’s dire financial position in the great depression meant she had to seek a full-time teaching position and also look after her ailing mother. In 1935, Carson gained a position with the U.S. Bureau of Fisheries giving educational radio talks about marine and aquatic life. Her broadcasts were well received as she managed to explain issues in an interesting and understandable way. This led to further writing opportunities and she was promoted to a full-time position of a professional aquatic biologist for the U.S. Fisheries Bureau. In her professional work, Carson was responsible for producing data on fishing populations, but in her spare time, she also wrote stories about marine life and voyages along the seafloor. Carson was given a contract by Simon & Schuster to write a book depicting this unfamiliar terrain. In 1941, she published “Under the Sea Wind.” She also had several essays published in various magazines and newspapers. After the war, she was retained by the new United States Fish and Wildlife Service, but burdened by administrative tasks she wished to devote her time to writing full-time. After successful publication of “The Sea Around Us” (1951), she was able to leave the civil service in 1952. In these books, Carson offered a compelling biography of the ocean and the interaction between the different animals and ecosystems. As well as explaining the biology of the ocean, it also contained a vision for protecting the oceans and ecosystems through public education. Throughout her life, Carson remained single. Though in 1957, one of her nieces died, leaving a five-year-old orphan son – Roger Christie. Carson adopted the boy and took the responsibility for bringing him up – along with her ageing mother. In 1957, she moved to Silver Spring, Maryland to care for her nephew. Carson was very close friends to Dorothy Freeman, who she met in 1953. They shared an extensive letter-writing friendship, and Carson appreciated their common interests and Freeman’s support for her work. In the post-war periods, she increasingly turned to the topic of ecological conservation. She joined conservation groups and began exploring the impact of economic development on the environment. The 1940s and 50s saw a period of rapid increase in the use of pesticides, such as DDT. The US Department of Agriculture was actively encouraging wide-spread spraying of chemicals to eradicate pests such as fire ants and Gypsy Moth – despite having little testing for civilian use. Carson spent considerable time researching the consequences of this new pesticide spraying programme and she gathered evidence about the dangers of using DDT. Carson was well-connected in the scientific community and she was given considerable evidence from Dr Ehrenfried Pfeiffer who headed a group of organic market gardeners. She also became aware of the powerful lobbying of representatives from the chemical industry, who were well-resourced to deny any potential damage from chemical production. From this research, Carson wrote a book, which became “Silent Spring” Whilst directly targetting the issue of pesticides, such as DDT, it raised wider issues such as challenging the orthodox opinion that scientific and economic progress was always a good thing. Carson turned this view on its head, suggesting that by ignoring the environment, we were heading towards a dystopian future, where man would suffer from falling out of harmony with the planet and the environment. Carson was also critical of the chemical industry and their approach of trying to shout down criticism and selectively promote studies sympathetic to the industry. She was also critical of government agencies, who appeared too willing to side with the chemical companies and their lobbying. The book was serialised in the New Yorker (1962) and was selected as ‘Book of the Month’ for October. With favourable reviews in the New York Times, the book became high profile – something heightened by a scandal breaking about the chemical thalidomide and its link with birth defects. On publication, the chemical industry responded with literature defending pesticide use. They threatened to sue and there was criticism of Carson’s character. However, the campaign backfired as more than anything it raised the profile of the potential dangers of pesticide use. Carson appeared on CBS reports TV special and this programme was well-received – helping to swing public opinion behind her book. Carson received numerous speaking invitations including offering testimony to the US Senate subcommittee. However, tragically, at the moment of being at the height of public profile, her health was failing as her breast cancer returned. Weakened by chemotherapy, she became ill with a respiratory virus in early 1964. By February she had developed anaemia and her cancer had reached her liver. She passed away from a heart attack on 14 April 1964. 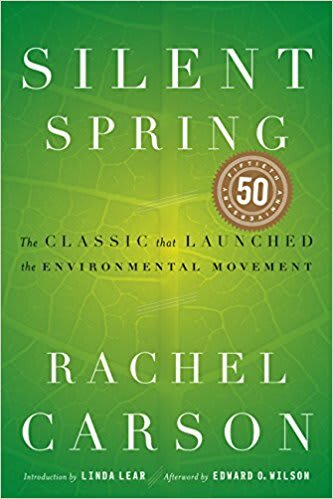 “Silent Spring” was an important turning point for the environmental movement and the uncritical use of pesticides. By 1972, the Environmental Defense Fund had succeeded in phasing out the use of DDT. But, perhaps, more importantly, it laid a groundwork for the deep-ecology movement, which sought to place environmental concerns about short-term materialistic convenience. It fitted easily into the new social movements of the 1960s, which sought to challenge long-held orthodoxies and replace them with a more holistic view of human progress. Citation: Pettinger, Tejvan. 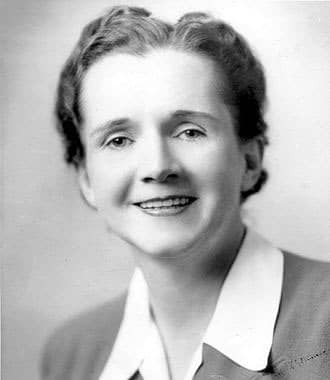 “Rachel Carson Biography”, Oxford, www.biographyonline.net, 21 July 2018. Famous Environmentalists – A list of famous environmentalists including conservationists, writers, political activists and those who have taken a lead in promoting a more caring approach to the environment.